The Flower Carpet is a biennial event in Brussels in which volunteers from around Belgium convene at the Grand Place, the historic centre of the city, to weave a carpet-like tapestry out of colorful begonias. The event takes place every other August, coordinating with Assumption Day. Nearly a million flowers are required to create the ephemeral 1,800 square metres (19,000 square feet) carpet. Landscape architect E. Stautemans initiated the first Flower Carpet in 1971. The year 1986 was the turning point in the holding of this event, which until then had not been regular. The Tapis de Fleurs de Bruxelles Association was then created at the initiative of the City of Brussels in cooperation with the Province de Brabant and Les Franc-Bourgeois (a central Brussels traders’ association). The new association laid down the regulations; the event was to be held every two years, for 3 to 4 days on the weekend of 15th August and could be enhanced by sound and lighting, fireworks, a jazz concert and other traditional folk entertainments. The tapestry always exhibits begonias, one of Belgium's major exports since 1860. Each year of the Flower Carpet, organisers select a theme for inspiration. In 2008, the patterns were inspired by 18th-Century French designs and colours. In 2010, the designers of the tapestry honored Belgian Herman Van Rompuy, the first president of the European Union, with images of historic Belgian symbols alongside the European Union logo. In 2012, the carpet exhibited the colours of Africa, inspired by traditional fabrics and tribal costumes. In 2014, the city of Brussels paid tribute to the 50th anniversary of Turkish immigrants by imitating the world-famous kilims. Turks came to Belgium in 1964 when both countries signed a bilateral treaty welcoming immigrants during the economic boom. In 2016, the carpet displayed a Japanese design to celebrate 150 years of friendship between Belgium and Japan. In 2018, the carpet featured cultural elements from the state of Guanajuato, Mexico. Including symbolism from the Chupícuaro, Otomí and Purépecha cultures. In addition to the begonias, the carpet included dahlias, the national flower of Mexico. ^ "Flower Carpet | Anniversary: 20th Flower Carpet! An ephemeral show on the world's most beautiful central square". www.flowercarpet.be. Retrieved 2016-02-06. ^ a b "Flower carpet | Event Carnival". Event Carnival. Retrieved 2016-02-06. 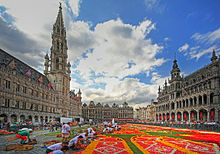 ^ a b "Giant Flower Carpet on the Grand Place in Brussels Pays Tribute to Turkish Immigrants". International Business Times UK. Retrieved 2016-02-06. ^ "Flower carpet - City of Brussels". www.brussels.be. Retrieved 2016-02-06. ^ "Coat of Arms of the City of Brussels, where a St. Michael, still valiantly conquering the devil was wreathed with the inscription "Bruxella Civitas Brabantiae"". ^ Forgione, Mary (21 July 2014). "Belgium: When 750,000 begonia flowers come to Brussels' main square". Los Angeles Times. Retrieved 6 February 2016. ^ "A Look at Belgium's Flower Carpets, Made of 750,000 Stems". Curbed. Retrieved 2016-02-06. ^ "Flower Carpet 2010 | Flower Carpet". www.flowercarpet.be. Retrieved 2016-02-06. ^ "Tissus africains pour le Tapis de Fleurs 2012". www.lavenir.net (in French). Retrieved 2016-02-06. ^ a b "Brussels Flower Carpet 2014 commemorates Turkish immigration in Belgium." Xinhua News Agency 14 Aug. 2014. Infotrac Newsstand. Web. 6 Feb. 2016. ^ "Flower Carpet 2016 | Flower Carpet". www.flowercarpet.brussels. Retrieved 2018-04-22. ^ a b "Flores mexicanas tapizan La Grand-Place de Bruselas". Excélsior (in Spanish). 16 August 2018. ^ Guanajuato lleva tapete de flores monumental a Bruselas (Video) (in Spanish). México Desconocido. 16 August 2018. Event occurs at 5 min 35 sec. This page was last edited on 10 February 2019, at 15:07 (UTC).